Learn social media marketing in plain English - step-by-step! Buy the workbook used at Stanford continuing studies to teach social media marketing for business. 2019 updated edition - all info verified, and a new chapter on Instagram, plus revisions on LinkedIn - compare the real reviews of this audiobook to reviews of other books. Learn to market your business on Facebook, LinkedIn, Instagram, YouTube, Twitter, Pinterest, and all major social media marketing platforms. Watch videos - view step-by-step companion videos that show you how to do social media marketing (listen for more details). This audiobook is the number-one best-selling workbook on social media marketing for business. 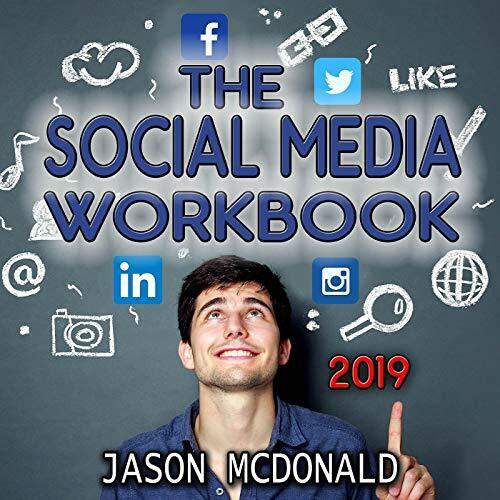 Check out Jason McDonald out on YouTube, or listen to the audiobook for more information on downloading Social Media Marketing Toolbook, which is used by Dr. McDonald in his courses, both online and on campus, at Stanford University's Continuing Studies. Got questions? Just Google "Jason McDonald" and send a quick email or call. This is a primer for total newbies not a business strategy, not useful at all. If you have a base understanding of social media marketing, this book increase your knowledge of SM marketing substantially. But if you really want to master the subject, you have to take advantage of the downloadable toolbook and the links he references in the book. They are excellent resources, many of which I didn't know existed. If you are listening to the book, you can easily jot down the links and refer to them later. He provides you with a password to download the entire book so accessing the links is a snap. I have definitely seen and significant increase in industry engagement as a result of ideas from the book. I am not sure why people are aggravated by the links. You can choose only the links that interest you, and I have yet to click a link that was not relevant to what I needed. The author also provides his email address if you have specific questions. I was skeptical but sent an email with a question, and I had a response within 24 hours. Well written and structured with tools to help with strategy and business planning. I devoured this book over five days via Audible during my daily commute to work. While I know a bit about social media I am no guru when it comes to SEO. Plenty of information for varying levels of knowledge. I feel newcomers will benefit the most from the SEO Fitness Wotkbook 2018 but even experienced marketers should glean some information if not some inspiration. Well worth the small price for a piece written by a Stanford PhD. I feel I received a fair amount of knowledge and I am inspired to pursue a higher level of training and knowledge. FYI Jason is quick to respond to email inquires - I feel like a I have a smart friend in the business now. This book offers a great framework to leverage social media for any type of business. It is informative and practical, but also allows you the opportunity to use creativity to adapt it to whatever your project or business might be. Worth the time to listen to the whole book, but also written to serve as a quick reference if you already know a lot of the basics or if you already have good reason to specialize on particular platforms (i.e. Facebook, Twitter, etc). This book also features the most comprehensive set of extra materials I've ever seen for an audiobook, including a full PDF version, worksheets, videos, and endless other resources. Worth checking out if you have ever wondered how to improve your influence on social media. Its okay its hard to finish. Alot of information that coulb be made more attention getting. Lose interest on some parts. But good and informative. Hard to follow. Not a lot of actionable steps to take. I got lost and I actually know quite a bit about and use social media in my business extensively. I clicked to download 2018 and somehow it downloaded 2017 Audiobook instead. Not satisfied with this. Where is the 2018 version???? yep, you must read this if you just read one book on the subject. don't read the "New Rules of PR and Marketing". The great audiobook for a person who is not familiar with SMM at all. But if you want to receive some deeper information for Social Madie you should consider another book. Most of all I was annoyed by links.